Special Bonuses available today - Friday the 26th! Who else wants to learn the secrets of opening and operating a very profitable coffee shop? If you do, then you MUST read this! The problem is most people haven't been truthful about how much it actually costs to open a coffee shop! for less than the price of a new car....In under 6 months! And didn't use a single penny of my own money! Watch This! Find the secrets to opening a coffee shop for a LOT less than you ever imagined. Is opening a coffee shop right for you? Maybe! Maybe Not! Opening a coffee shop will definitely provide you with many opportunities and challenges. Are you looking for a way to supplement your current income. Did you know that for less than $500.00 you can start a coffee service company that generates you over a $1,000.00 a month by only working a few hours a week? Wanted to be free to do something that I love. Wanted to be free to set my own schedule. Wanted to spend my time getting to know people. Are you ready for freedom from someone telling when you have to be at work in the morning? Are you ready to actually get paid what you're worth? Are you ready to wake up every morning to the smell of freshly brewed coffee? "They" Haven't Told The Truth! There are some people within the coffee industry who have not been telling the truth about how much it actually cost to open a coffee shop or open a coffee service business. There are two reasons for this. They are trying to sell you something. Either some really expensive equipment, or some expensive consulting. "They" don't want to create more competition for themselves (ie, other coffee shop owners). Let me introduce myself, my name is Wayne Mullins and I am the former co-owner of two successful coffee shops . I was recruited by the founder of a coffee shop to come help him grow his existing coffee shop, and open a new location. He wanted to open the new coffee shop in under 6 months. I knew it would be possible, but we would need to create a system to make sure that we didn't waste any time. After I told him it could be done it in less than 6 months, he said he had one more "small" requirement. He said it had to be opened for less than $25,000! Back to the "drawing board" I went. I wasn't even sure were to start. You see, I had never been involved in the coffee industry before. Actually, I had never even worked at a restaurant either. Why would the owner of a coffee shop call me and try to recruit me? Honestly, it had nothing to do with my skills or abilities. Well, what was his reason for recruiting me? I had spent the last three years as the owner of a VERY successful lawn company. But it wasn't always that way. As a matter of fact, after my first year in the lawn industry, I was completely broke and ready to quit. .....a multi-million dollar lawn company. This man became my mentor....he taught me strategies and tactics that resulted in my lawn company growing from $25,000.00 to $200,000.00 in sales, in less than two years. My friends and family could not believe the "instant" success I became. What they didn't realize, was my "instant" success was the result of the SECRETS my mentor was teaching me. I'll save you all the details, but after my company hit $200,000.00 in sales, someone offered me a lot of money for my lawn company, and I couldn't refuse the offer. Shortly after selling my company, the owner of the coffee shop recruited me. My mentor taught me many powerful techniques and stategies, but he also revealed a secret to me. The secret was something called the Central Nervous System. Odds are you've never heard of it before, but you're very likely to have personally witnessed the POWERFUL results it brings. If you've ever been to a McDonalds then you've seen the power of a Central Nervous System at work. Maybe you've eaten at a Subway restaurant. If so, you've seen the Central Nervous System at work. So How Much Did it Actually Cost to Open Our Coffee Shop? We actually opened the coffee shop for less than $25,000. Without first creating a Central Nervous System it would have cost a LOT more. The great news is everything we did can be repeated. You don't need any special knowledge or skills. It just takes a little time and effort to develop your own Central Nervous System. Another gentleman created a Central Nervous System which enabled him to open a coffee services business for less than $500.00. He supplies local businesses and offices with their coffee, and coffee supplies. He's making over $2,000.00 per month and only working a few hours a week. This never would have been possible if it had not been for the Central Nervous System he created. What is a Central Nervous System? As I mentioned earlier, it is the core operation system that a business works off of. In other words, it is the system that controls every aspect of how a business operates. Similar to the way your central nervous system controls the entire nervous system in your body. Think about franchises, what makes them so popular and so successful? It's because they are all based on a core business system, or a Central Nervous System. Without a "core operating system" a coffee shop will NEVER reach its full potential. The great thing is you don't have to have any special knowledge or training to create you own Central Nervous System. Creating your very own Central Nervous System will enable you to spend time on what really matters, growing your business. You no longer have spend all of your time and energy on "fixing" problems. Your Central Nervous System has the answer already in place. If you are serious about opening a coffee shop or a coffee service business, you must spend time developing your very own Central Nervous System. Think of it as a business plan on steriods. It sounds so simple, does it work? My mentor became a millionaire by implementing a Central Nervous System in his business. My company's sales increased by 800% in the 2 years after creating a Central Nervous System. The owner of a coffee shop has opened 2 new locations in the past 2 years, each for less than $25,000, as a result of the Central Nervous System. Look at franchises! They all operate off of a "core operating system". If you are not just a dreamer, and you are ready learn how to open your own coffee shop or coffee service business, pick up a copy of Coffee Shop Secrets today. This course will show you exactly how you can create your very own Central Nervous System. As a matter of fact, I'll give you over eighty individual steps you need to take to open your very own coffee shop. Coffee Shop Secrets Shows You Exactly What To Do Next! Obviously, if you have read this far then you are serious about learning how to open a coffee shop or coffee service business. Which is good, you aren't just a dreamer, you are someone who makes their dreams a reality. I promise, the hardest part of opening a coffee shop or coffee service business is the decision to do it. This course includes the same information we used to create our own Central Nervous System. Coffee Shop Secrets is designed to walk you through the entire process of opening a coffee shop. If you can follow instructions, you can open your own coffee shop! 7 Ways to Get Financing! 3 Questions you must know before financing your equipment! Real-world market statistics answer the question, "Is there room for me?" 4 critical issues to arrange before you startup. 80 individual steps you need to take to insure your coffee shop is successful. The #1 goal when naming your business. How to detemine if you should leave your job. When you should quit your job. 7 simple ideas for developing your business plan (Central Nervous System). The marketing secrets which enable rapid growth. The single question that can double your profit. The absolute best location for your coffee shop. A detailed Lease Checklist to ensure you don't forget anything. A POWERFUL secret to designing your shop on a shoe-string budget. The single most important thing to know when purchasing your espresso machine. Where to get the BEST beans. What equipment you must have and where to get it. How to determine your hours of operation. What time you should never close. The real secret to a profitable menu. 10 low-cost, super-effective marketing methods that create a buzz. Discover our best-ever promotional technique. How to keep up with the coffee industry. The #1 principle that will virtually guarantee your success. When to sign a lease. When to hire a contractor. When & how to hire employees. What's inside "Coffee Shop Resources"? Employee Handbook - Sets Clear Expectations. Addresses probationary periods for new employees. Addresses: promotions, resignations, & pay increases. How corrective discipline will occur. Shows employees what critical, serious & major offenses are. Provides alcohol & drug policies. Discusses employee dress code requirements. Includes a release of information form to allow for background checks as well as drug & alcohol testing. An employment application to help screen potential employees. A performance review to help monitor employee performance. Secret shopper survey - allows you to see what your customers see and think about your coffee shop. Opening & Closing Checklist to insure employees understand what must be done prior to opening and after closing. What's inside Coffee Shop Contacts? Includes a few of my personal contacts from when I was the co-owner of two highly successful coffee shops. One of the contacts has been responsible for financing dozens of coffee shops all accross the country. The best person to contact for establishing your merchant account. The source for the best coffee beans in the world, in my opinion. I give you not only the company name and number, but I give you specifically who you should ask for when you call. Again, in my opinion, this is the most comprehensive course on opening and running a successful coffee shop available. But hey, I am biased. If you order by midnight on Friday the 26th, you'll get the following bonuses! My Coffee Shop Recipe e-book. This book shows you how to make 20 of the most popular (and profitable) coffee shop drinks. Access to my five day quick start video course "How To Open A Coffee Shop" where you will see exactly what you need to do starting today. Plus I'll include my 15 minute video showing you exactly how to create your very own Central Nervous System. Access to a couple of conference calls with coffee industry "experts". One call is with a company that has financed dozens of coffee shops all across America. You'll get to hear exactly what is needed to get money to open your coffee shop. The other call is with the company behind the best beans in America. You will also get my personal email address so you can ask me any questions that may come up during the process of opening your coffee shop. No Arm Twisting Allowed On This Site! I'm not here to tell you all the reasons why "the world will end tomorrow if you don't buy my Coffee Shops Secrets course". It's not! I realize that Coffee Shop Secrets isn't for everyone. You may be happy with the way things currently are in your life, and that is fine. I don't want you buying my course if you don't think it will help you realize your dream of opening your own coffee shop or coffee service business. Coffee Shop Secrets is not for people who think they can sit on their couch and have a coffee shop magically open for you. Opening a coffee shop is work! But Coffee Shop Secrets will guide you straight through the process with the fewest possible mistakes (saving you money and your valuable time). My Strong hunch is that if you've read this far you are seriously considering opening you very own coffee shop. Go ahead and take the first step. Get some help from someone who has been there, done that, and got the t-shirt! My CRAZY 60 Day No-Risk-100%-Guarantee! You can use all the tools and strategies from "Coffee Shop Secrets" for a full 60 days. If you aren't convinced the strategies and tools will help you open and then operate a successful coffee shop, I'll refund 100% of your investment. No hoops to jump through. No telephone number to call. One single email requesting a refund and you get a 100% refund, plus you get to keep then entire course! I assume all the risk so you have none! Get the entire course digital version for only $67.00! The Coffee Shop Secrets course will available on your computer within 5 minutes of completing your order. 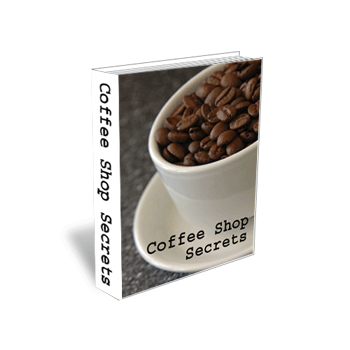 Coffee Shop Secrets (digital version) for only $67.00. You can start learning how to open your very own coffee shop within 5 minutes of completing your order. You have nothing to lose; your Satisfaction is Guaranteed. If for any reason you are not satisfied, please contact me for a full refund. P.S. - Look, I sell this course everyday for $97.00, but I'm testing out this new low price on the instantly downloadable edition. The price of $67.00 will only last for a limited time. You know this is a great offer, so go ahead and pick up your copy before they are all gone. If you're at all interested, you should CLICK HERE and order right now. P.P.S. - Pick up your copy before midnight on Friday the 26th and receive all of the free bonuses. The bonuses alone are worth more than three times your $67.00 investment.